Be the first to share your favorite memory, photo or story of Cpl Claire. This memorial page is dedicated for family, friends and future generations to celebrate the life of their loved one. Cpl. Claire Eulin Goldtrap, 21, Hobart, Oklahoma was born on April 10, 1922 in Hobart, Oklahoma to Lala Blanche Goldtrap. He died while serving our country during World War 11 on November 20, 1943. He was missing in action until he was accounted for on July 23, 2018. 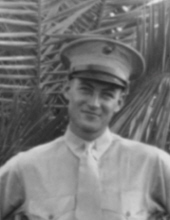 In June 1940, Claire Goldtrap and John “Big Moore” Moore enlisted in the Marine Corps. Goldtrap enlisted in Oklahoma City. Moore enlisted in Dallas. They completed basic training at Camp Lejeune, North Carolina. In early 1941, Goldtrap and Moore became range instructors at the Marine Corps Rifle Range in La Jolla, California. They later were joined by Moore’s younger brother, Edward “Little Moore” Moore. During their range time, Goldy and Big Moore volunteered for a new unit of amphibious tractors. Little Moore had to wait because he did not have enough time in to transfer. In November 1943, Goldtrap was among the Marines that landed against stiff Japanese resistance on the small island of Betio in the Tarawa Atoll of the Gilbert Islands, in an attempt to secure the island. Over several days of intense fighting at Tarawa, approximately 1,000 Marines and Sailors were killed and more than 2,000 were wounded, but the Japanese were virtually annihilated. Goldtrap died on the first day of the battle, during the first wave of the assault. Goldy was reported missing and ultimately declared dead on November 20, 1943. Recorded circumstances attributed to: "Missing in action or lost at sea". Incident location: Tarawa. Goldy is memorialized at “Tablets of the Missing” at Honolulu Memorial, Honolulu, Hawaii. This is an American Battle Monuments Commission location. Graveside services will be 11:00 a.m., Wednesday, April 10, 2019 at Hobart Rose Cemetery, Hobart, Oklahoma. Services have been entrusted to Martin-Dugger Funeral Home in Elk City, Oklahoma. Memorials can be made to Hero Flights in care of Martin-Dugger Funeral Home, P.O. Box 707, Elk City, Oklahoma 73648. To send flowers or a remembrance gift to the family of Cpl Claire Eulin Goldtrap, please visit our Tribute Store. "Email Address" would like to share the life celebration of Cpl Claire Eulin Goldtrap. Click on the "link" to go to share a favorite memory or leave a condolence message for the family.